Unless the draft SNP budget is amended, cuts in walking/cycling investment look to be even worse than Spokes predicted, with only some 67 pence of every £100 transport spending likely to go to active travel. Please contact your MSPs and join the lunchtime protest on Weds 11 January [click on the graphic and see end of this article]. JAN 9 LATEST – See our new BUDGET PROTEST HANDOUT [pdf 774k]. Over 250 people now signed up to come, including from around Scotland!! Investment in walking/cycling in the budget is not specified separately, but is buried within 3 separate headings – CWSS, SAT and FTF. Thanks to questions by people like you to their MSPs, the detail has become clearer. See the Spokes update briefing to MSPs [pdf 118k] – the update also includes a response to an extremely unconvincing letter from Cabinet Secretary for Infrastructure Alex Neil MSP [2.1MB]. 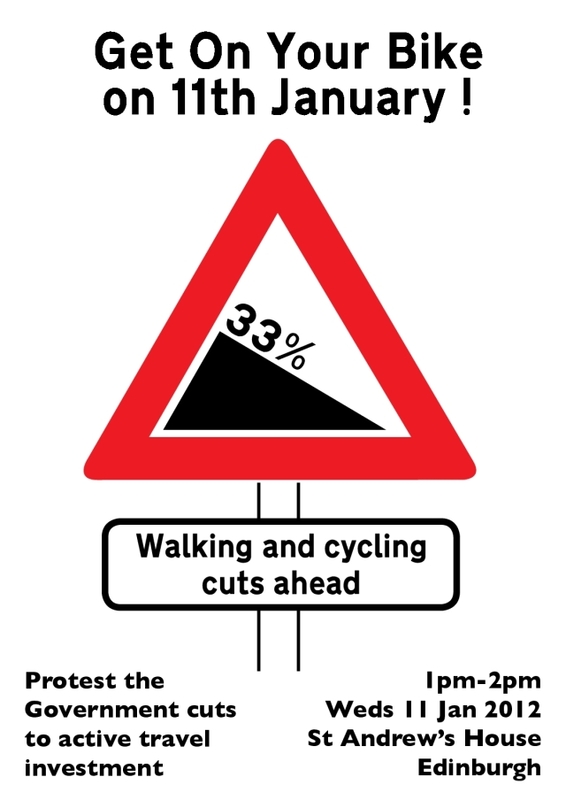 Instead of the 20% cut to active travel which we had predicted, the draft budget looks likely to mean a 32% cut in 2012/13 (following an 18% cut this year). Thus walk/cycle investment in 2012/13 will be little more than half its level in 2010/11 – and that was miserable enough! From a mere 1.21% of total transport in 2010/11 it falls to 1.03% this year, and is set to plummet to 0.67% in 2012/13 if the draft budget is not changed. Maybe we could understand it if total transport spending was plummeting. But no! – it is shooting up, thanks to a £100m boost to trunk road spending – an increase which is 8 times the total likely investment in walking and cycling in 2012/13. Contact your MSPs urgently if you’ve not done so, or if you’re unhappy with their answer. Find them at www.writetothem.com. 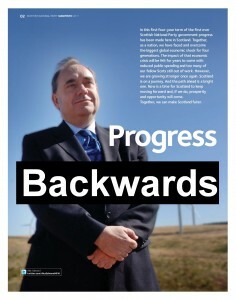 If it helps, see our thoughts on the responses from government MSPs. Discussions are still ongoing on the final version of the budget, and it will then have to be voted on in Parliament. Come to the protest at 1pm on Wednesday 11 January at St Andrews House, Regent Road – the offices of First Minister Alex Salmond MSP and Finance Secretary John Swinney MSP. John Swinney has been invited to come outside and receive a letter about active travel funding. Organised by Stop Climate Chaos Scotland, Transform Scotland, FOE, WWF, and with Spokes support, already over 150 people have said they’ll be there!! Click here for more information. If you can or hope to come, please sign up on facebook [and see everyone else there!] or email gailATstopclimatechaosscotland.org (replacing AT with @). 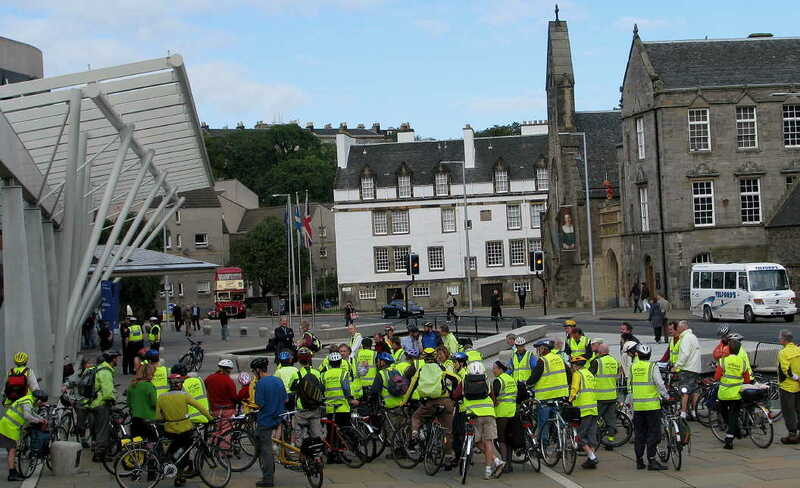 The 2008 Spokes budget demo at Scottish Parliament. Then we were arguing for cycle funding to be raised to a realistic level, in line with government cycle-use targets. This time we are arguing against savage cuts, alongside a huge rise in trunk road funding, and we expect many more people. [NB – remember the protest is at St Andrews House, not at the Scottish Parliament].